CONSTRUCTION CONTINUES IN AND AROUND MANCHESTER: Building work on the Manchester City Art Gallery extension is now officially underway. It will cost £24m and will double the display area. Work on the new footbridge across Corporation St began today. 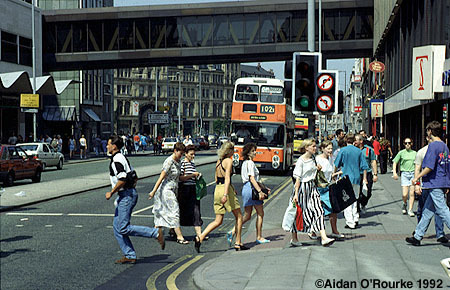 It replaces the old bridge which was only a few feet away from the IRA bomb. 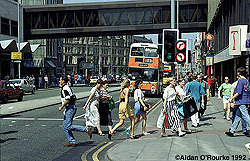 On the left is my photo of Corporation St in 1992. On the right is an artist's impression of the new bridge taken from today's MEN. OTHER CURRENT BUILDING projects include the Great Northern Goods Warehouse, where a new tower resembling a giant razor blade has been erected at the corner of Peter St and Deansgate. The first parts of the convention centre next to GMEX have started to appear, and over on Lower Mosley St, a new office building opposite the Midland Hotel is climbing higher and higher. On Whitworth St, the Bridgewater Bank residential development Phase 3 has filled in the missing facade to the right of the former Hacienda. Apartment conversions are underway at Whitworth St near the Gay Village, including the northern end of Shena Simon College (right). After last week's topping out, work on the M&S building is proceeding steadily. The buildings between the former Shambles and Deansgate are about to be demolished. And outside the city centre, one of the most exciting construction projects is the new Metrolink line across Salford Quays to Eccles. At Eccles, a new underpass will take the trams under the big roundabout at the end of Regent Road and on to Eccles town centre, pictured above. AN OLD IRONWORKS on the Medlock south east of Oldham is to be transformed into a tourist attraction thanks to a lottery grant of £268,000. Park Bridge Ironworks closed in 1963 and has since lain disused. But the site is to be completely restored, including its tunnels, tramways and mines. 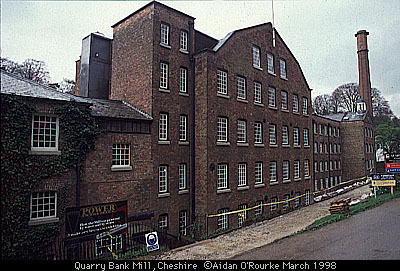 The award-winning Quarry Bank Mill (picture left), one mile south east of Manchester Airport, recreates 19th century life at a cotton mill and is one of the National Trust's most successful properties. A PALACE IN RAJASTHAN or a four-bedroomed detached in Oldham: Which would you prefer? Well, an aristocratic couple from India, featured on page 3 of Saturday's MEN, seem to prefer the latter. Shruti Kumari, whose family ruled over large areas of Rajasthan until 1947, came to Britain to join her husband, property developer Kumar Ajit Singh Medtia, who runs Red Lion Construction. 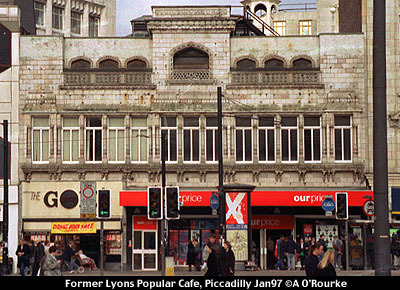 Talking of Indian palaces, there's a unique but sadly neglected facade on Piccadilly (picture right). It used to be the home of Lyons Popular Cafe. You can still see the "Taj Mahal" style details, but the towers have sadly gone. I think the building should be restored and re-opened as an Indian restaurant called... how about:"The Moghul Palace"! 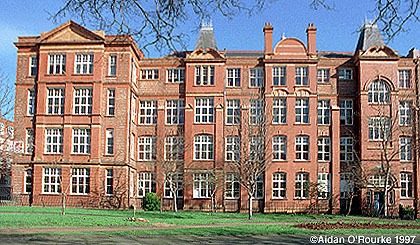 THERE'S A MENINGITIS ALERT at Manchester University after a bio-sciences student came down with the disease. She's in Manchester Royal Infirmary, and her condition is said to be stable and improving. Her immediate circle of friends have been given anti-biotics, and University authorities have sent out a letter to students with information about the disease. Spokesman Andy Swain has been speaking on radio to give reassurance. LEISURE AND IT/NEW MEDIA are going to be the big growth areas of the next 10 years, according to a Co-op Bank/MEN Business in the Millenium survey. Four in 10 business leaders in the local region think the Internet will in future have a stronger impact on their business than at present - 24 per cent said it would have no effect. A third of businesses here still don't have Internet access. The survey also revealed the areas which respondents thought will decline in the next ten years: Textiles, engineering and manufacturing. NORTH MANCHESTER HIGH SCHOOL FOR GIRLS was in the top 40 most improved schools in the country - In 1993 it was the third worst for truancy, so credit is due to both staff and pupils. Yes, more and more schools are cleaning up their act nowadays and turning bad statistics into shining success stories. Often, a new name, new uniform, and a new paint job seem to accompany a major turnaround. And private enterprise is also getting involved in the running of state schools: Cheadle-based education specialists Nord Anglia have been negotiating the take-over of a failing comprehensive school in the south east. AARON NICHOLS, 18, WAS FOUND GUILTY at Manchester Crown Court of murdering Lauren Carhart by dousing her with lighter fuel and setting her alight. Relatives of the victim were relieved when Nichols was given a life sentence. A WITNESS HAS GONE TO JAIL rather than give testify against two men charged with conspiracy to murder. Sajid Perviaz was afraid he and his girlfrield would be "smoked", ie. shot if he went ahead. Last year, Julian Wagaba, 18, was shot on Monica Grove, Levenshulme. His mother Sylvia said: "There is fear everywhere in Manchester". TWO MEN WERE SHOT AND WOUNDED on Saturday afternoon on Copthorne Crescent, Longsight. Pierre Williams, 25 and Dennis Saunders, 37 both from Moss Side, are recovering in hospital, but are reported to be refusing to answer questions. Chief Superindentant Lillian King, head of GMP's south Manchester division, has said that the Police aim to remove gun crime from south Manchester. TWO GREATER MANCHESTER POLICEMEN may be prosecuted under the new Crime and Disorder act, after an incident in which an Asian policewoman was the target of verbal racist abuse. Recently GMP Police Constable David Wilmot provoked controversy when he said that there was "institutionalised racism" in the Greater Manchester police force. In the eighties, former GMP Chief Constable James Anderton provoked a great deal of controversy with his remarks about homosexuality. ANN WEST, mother of Moors murder victim Lesley-Ann Downey, (apologies for previously naming her as Lesley Ann West) died at her home in Fallowfield last week. She was 69 and had battled against cancer for many years. She campaigned that Moors murderer Myra Hindley should never be released from prison. "I hope my name lives on and will haunt Hindley every day in a cell until she dies" she said. On Boxing Day 1964, 10 year old Lesley Ann was taken from a funfair near her home in Ancoats, then tortured and murdered by Ian Brady and Myra Hindley. The body was buried on Saddleworth Moor. In a MEN reader poll most respondents thought Myra Hindley should stay in prison. The suffering of the mothers of Moors murder victims was the inspiration for Manchester-raised Caleb Johnson, who wrote the drama "Forgotten" which begins tonight on ITV. 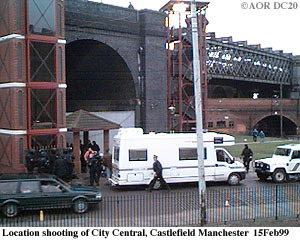 IT'S AN OFFENCE TO IMPERSONATE A POLICEMAN, but today at the far end of GMEX car park, overlooking Castlefield, I was confronted with a team of men dressed in dark blue police combat outfits (right), with helmets and machine guns, but not one of them was apolice officer. In fact they were actors taking part in the second series of City Central, which is currently being filmed at various locations around Manchester. There were cameramen, make-up artists, support staff, and, most confusingly, some real police officers! Later the crew did some more filming on the old railway viaduct (picture top right), just next to the Metrolink line. Yes, I've often thought I'd like to be a police officer, but only if I could get out one of those portable flashing lights and stick it on the top of my car. Well, a car accessory shop in the Arndale Centre has been selling lights like this in various colours -the light is powered from your cigar lighter and is equipped with a magnet - the blue one could be mistaken for a police flashing light. The shop has been cricitised for stocking the items. Playing cops and robbers may seem like fun, but there's a serious side: Senior citizen Ruth Derbyshire of Stockport was robbed of jewellery and £3000 in cash after she allowed a man posing as a policeman to enter her home. BOLTON BOY JAMES CARLTON is one of the actors in the new ITV comedy "Days Like These", which is written by the makers of the Cosby Show and Roseanne and set in 1976. It's been ages since ITV have had a hit comedy, and after watching the first episode of "Days Like These", I think they'll be waiting a long time yet. And a new Channel 4 drama set in Manchester's Gay Village is being promoted via billboard posters around the city centre and throughout the country. "Queer as Folk" starts later this week. I wonder what James Anderton would think. And at the Variety Club awards, actor Steve Coogan from Middleton was honoured. BRYAN MOSELY, alias Alf Roberts of Coronation St, died last week aged 67. Over the past week, I've heard many actors and showbiz people express their sadness at his passing, particularly as his on-screen death took place so recently. ANDY ROURKE of the legendary Manchester band The Smiths, has been made bankrupt, Paul Taylor reports in Saturday's MEN. Three months ago, the dispute between band members reached the High Court - Mike Joyce came out with £1m, but Rourke didn't benefit, as he opted out of legal action 10 years ago, accepting a payment of £83,000, a derisory sum in view of the band's earnings. The High Court ordered Morrissey and Johnny Marr to pay Joyce £1m. Judge Weeks said that Morrisey had been "devious, truculent and unreliable when his own interests were at stak". Andy Rourke lives in a detached house in Burnage, and has a new band, named Foreign Bodies. Here's Burnage (above) a week ago, and note the price of petrol. The cheapest petrol I've come across was at a station in Blackburn - only 59.9p a litre - that's £2.73 or about $4.30 per gallon. THIS WEEK'S PERFORMANCES AND EVENTS include the Manchester Dogs Show at GMEX - The Northern Ideal Home show will be coming in April. The Vienna Symphony Orchestra and the Halle played at the Bridgewater Hall, the Bucharest String Duo at the Midland, the Sema Concerto Award Concert and the Brodsky Quartet were at the RNCM. John Shuttleworth amused audiences at the Carlsberg Ice Comedy Theatre at the Dancehouse Theatre Oxford Rd, and comedian Alan Davies performed at the Bridgewater Hall. The Caucasian Chalk Circle continues at the Library Theatre, and the Pirates of Penzance at the Opera House. Crowds of children have been attending the Dinosaur exhibition at the Museum of Science and Industry. Future bookings at the MEN Arena include: Happy Mondays Friday 23 April, Little Richard & co, Monday 17th May, Blondie on June18, REM July 17, 911 Saturday 4 September and Manchester-based Pete Waterman's protege fivesome Steps on October 30th. Oh, and have a look at the GMEX website - it's at: http://www.g-mex.co.uk. 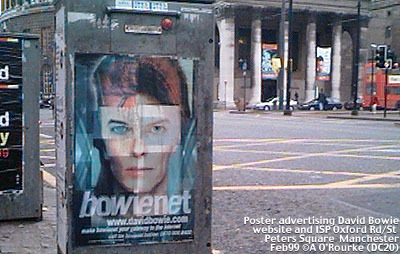 And after mentioning a 20 year old David Bowie graffiti in last week's EWM, I was surprised to see a David Bowie poster in Manchester city centre. He's now offering to be your Internet service provider. I remember seeing adverts for David Bowie's first major concert in Manchester at the "Hard Rock" concert hall on Great Stone Road Stretford in 1972. It's now a B&Q DIY store. 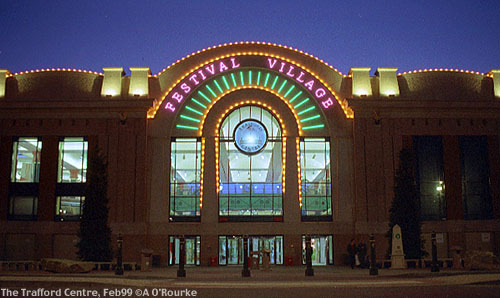 MONICA LEWINSKY WILL BE VISITING the Trafford Centre on Thursday the 25th of March. She'll be at the County Bookshop for a book signing from 11am to 3pm. Originally she was booked for the County bookstore in Rochdale. Talking of Rochdale, 48 year old Mike Cooper showed heroic qualities when he rescued people from the Chamonix avalanche which killed 14 people. Mike Cooper, who works as a guide there, is originally from Rochdale. Are you reading this, Mike? KIT THE CAT, the 2002 Games mascot, made a double appearance in Tuesday's MEN - on page 14 he posed with Sir David Trippier, who held a shovel for the camera to mark the start of restoration work on the Ashton Canal at the 2002 site. And on the right hand page, Kit (actually not a real cat but a person wearing a cat's head!) was pictured at the Manchester Online offices, with my colleagues Simon, Lisa, Ben and others, including New Media Director Tony Whalley. He's the one who commissioned Eyewitness in Manchester to be part of Manchester Online (Tony Whalley, not Kit the Cat!). 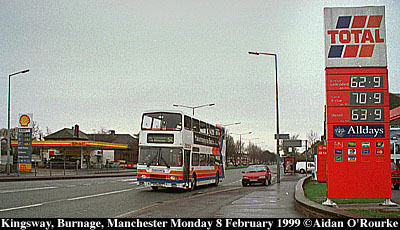 Manchester Online have just launched the official 2002 Games website. You'll find it at http://www.commonwealthgames2002.org.uk. These internet addresses seem to be getting very long these days. COMMONWEALTH GAMES OFFICIALS met over the weekend to decide which sports will be chosen. 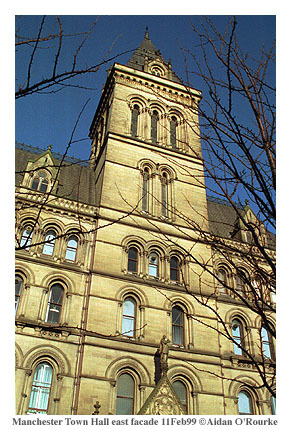 Manchester officials are reported to favour team sports, which attract sponsors, viewers, and income. A decision won't be made for another six weeks or so. ST VALENTINES DAY was also wedding day at Manchester registry office yesterday. It was the first time a register office in England opened on a Sunday. Officials bent the rules so that Lee Geddes and Samantha Moss could get married on Feb 14th. And tomorrow is Chinese New Year, and there will be celebrations in Manchester's Chinatown. THIS WEEK'S WEATHER has been mixed: very good for part of last week, cold and drizzly the rest of the time. The best days were Tuesday and Thursay, when there was glorious sunshine over Manchester and the entire region. Friday was misty and rainy in the afternoon. The past three days have been cloudy. Here's how the "lesser" end of the Town Hall looked as I went for lunch on Thursday, round midday. Current EWM temperature 7 celsius, 45 fahrenheit. Please bookmark this page so you can come straight into the newsletter. The new screensaver is nearly ready one or two further teething troubles to fix. 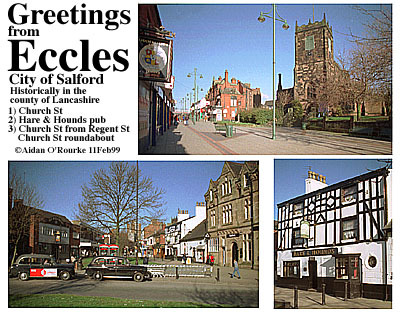 Please note - the Manchester Online directory structure was simplified last week- the "webspace" has now gone. Please change your bookmarks accordingly. Please sign up for the mailing list and claim your high-resolution photo. It's waiting there for you to "grab" but I'll be removing it soon, so act now!